Foreword. I: Inelasticity of Metal Matrix Composites. Rate effects of hot isostatic pressing of a unidirectional SiC/Ti composite (Y.A. Bahei-El-Din, G.J. Dvorak). Effect of oxidation on damage evolution in titanium matrix MMC's (L.D. Hurtado, D.H. Allen). A cyclic plasticity model for metal-matrix-composites using an anisotropic yield surface (G.Z. Voyiadjis, G. Thiagarajan). Elastic and elastic-plastic properties of silicon carbide reinforced aluminum matrix composites (N. Yu et al.). On the mechanics of plastic deformation in metal matrix composites (H.M. Zbib, H.T. Zhu). II: Micromechanics of Metal Matrix Composites. Effective elastoplastic behavior of two-phase metal matrix composites: micromechanics and computational algorithms (J.W. Ju, K.H. Tseng). Micromechanic and macroscopic thermoviscoplastic behavior of short fibre MMC (S. Kruch, J.L. Chaboche, N. El Mayas). Micromechanics of active metal matrix composites with shape memory alloy fibers (D.C. Lagoudas, Z. Bo, M.A. Qidwai). Experiments of crack-fiber interactions in composites with frictional interfaces (M.C. Larson). Micromechanical determination of the viscoplastic behavior of a metal-matrix composite (J.Li, G.J. Weng). Geometrical non-linearity effect on fatigue crack tip deformation (T.H. Lin, Q.Y. Chen, S.R. Lin). Modelling interfacial debonding in titanium matrix composites (C.J. Lissenden, C.T. Herakovich). A micromechanical constitutive model for rigid particles embedded in an elastic matrix (N.J. Mattei, M.M. Mehrabadi). Thermo-inelastic analysis of functionally graded materials: inapplicability of the classical micromechanics approach (M.-J. Pindera, J. Aboudi, S.M. Arnold). Micromechanical modeling of damage and plasticity in continuously reinforced MMCs (G.Z. Voyiadjis, P.I. Kattan). Author Index. 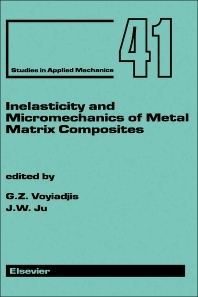 This book contains fifteen papers based on the presentations made at the symposium on "Inelasticity and Micromechanics of Metal Matrix Composites" held at the University of Washington, USA, in mid-1994. The papers represent the most recent work conducted on inelasticity and micromechanics of metal matrix composites. The book is divided into two parts: Part I deals with the study of inelastic deformation in metal matrix composites, while Part II tackles the micromechanical aspects of metal matrix composites. The articles discuss different aspects of these two topics ranging from purely theoretical treatments to extensive experimental investigations. Many of the papers are by prominent researchers working in this area.